Clodagh is responsible for investigating and actioning relevant opportunities for funding to support the development of new InnoTech centre projects. This includes the development of project proposals for a range of funded programmes including Erasmus+, Interreg and Horizon 2020. She has significant experience in the development of collaborative European funded projects, specifically research and innovation projects in the area of STEM education, manufacturing and renewable energy. 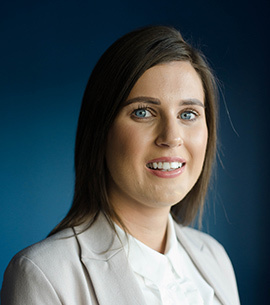 Clodagh has recently completed an MSc in Business Development and Innovation at Ulster University which has provided her with an in-depth knowledge and understanding of a range of business-related disciplines including business strategy, innovation and international business development. In her role, Clodagh is also responsible for the programme management of externally funded business innovation programmes at InnoTech. Since 2014, she has delivered three SME innovation programmes on behalf of Lisburn & Castlereagh City Council including the Business Solutions Innovation Programme and Lisburn Future Industries Programme. Collectively these have supported 32 businesses offering flexible, client-led, and practical support to help the companies identify and develop innovative and commercial opportunities. She is currently programme managing the Mid-Ulster Council funded Engineering Innovation Programme developed to support companies embed innovation and improve their capacity for growth and development.